Ericsson (NASDAQ: ERIC) opened Mobile World Congress (MWC) 2017 with three stand-out announcements featuring partners and major customers. These included network evolution towards 5G; an innovative new business model between content owners and operators to bring media to people more conveniently; and industry transformation in the transport sector. 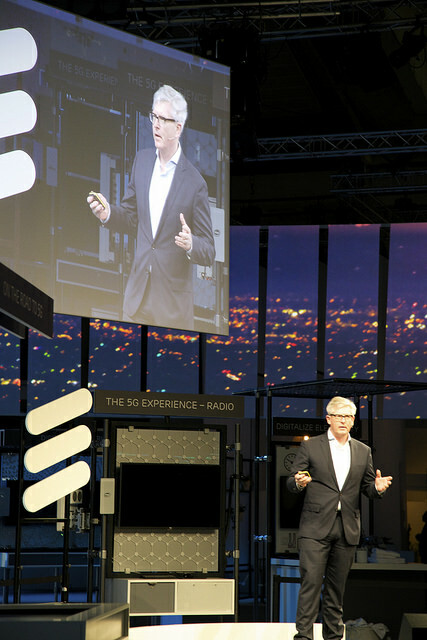 During the Media & Analyst briefing on Monday, February 27, Ericsson President and CEO Börje Ekholm said: "We are currently working to set the future direction of Ericsson. It takes grit and grace - and team spirit - to succeed on the digital frontier. We will relentlessly push the technology frontier - and always ask ourselves how we can make our customers more successful. We know that it is what our customers expect from us, what they need from us in order for us to be their best partner also in the future. "At Mobile World Congress 2017, we are showing that our capabilities in 5G and those within media and transport industries, for example, are out front and market-leading. We are ready today. We have the full ecosystem of partners and customers selecting us to deliver high-performance networks, media solutions, and business models in industries such as transport," he continued. Following up Ericsson's launch of a suite of 5G products and services coming to market in 2017, Ekholm announced new 5G New Radio (NR) trials in partnership with Qualcomm: NTT DoCoMo, Vodafone, and Telstra Australia. Ekholm said: "5G will transform all industries, and our customers are already gearing up for the future by evolving their current 4G networks. This is the key foundation to enable the automation and business transformation needed for the Internet of Things, as well as data-hungry services like Virtual Reality and Augmented Reality." In a new study, Ericsson foresees a 1.23 USD trillion market in 2026 to be addressed by 5G. Ekholm said: "This means that industries see the value of 5G and we will be there to grasp that opportunity." Ekholm was joined onstage by Telstra CEO Andy Penn, who said that 5G was an essential enabler for future services, and focused especially on the new media solution announced in collaboration with Ericsson and Fox Innovation Lab. Hanno Basse, CTO of 21st Century Fox and Managing Director of Fox Innovation Lab, also joined Ekholm and Penn onstage, saying the solution will set the industry trend by bringing new content to subscribers in a fast, convenient way. T-Mobile's CTO, Neville Ray, talked about his own company's plans to fortify their current LTE network in readiness for 5G. Ray said: "T-Mobile's LTE network is the most advanced in the US and we'll continue to deploy the latest, global leading technologies that will create the foundation of a powerful 5G network built for mobility. We work closely with strategic partners like Ericsson to deliver the most advanced technologies that enhance our customers' experience." 5G will be the technology to pioneer transformation across all industries, and one part of Ericsson's Hall 2 that is impossible to miss is the Scania semi-truck cab. It served as the backdrop to announce a new Connected Vehicle Marketplace, with Scania CEO Henrik Henriksson as guest. Finally, Ekholm invited visitors to try out all of the 70+ demonstrations that Ericsson is showing in its Hall 2 at Fira Gran Via, including the tactile internet and Virtual Reality experiences. With our customers and partners, we work across industries, physical boundaries and perceived limitations. Join us in Hall 2 or online during MWC 2017 and engage in conversations and demonstrations about our favorite things: 5G; platforms and services for IT, Cloud, Networks, and TV & Media; connected solutions for industries; the Internet of Things; and partnering for success. What is the Connected Vehicle Marketplace?